Python Transformations - now uses the same Python version 3.7.2 as in the transformation sandbox. R transformations have a new backend (v 3.5.2), and we added docs about how to do opt-in in the new version. Storage Writer - now supports the `recreate` mode that will drop and create the target table. Processor Decompress - supports graceful decompression, will skip the file that failed to decompress. Mysql/Mssql/ extractors - allow any numeric or datetime type for incremental fetching. PostgreSQL - has automatic increment fetching. UI has to be migrated to the new version (by the green button in the config overview). Generic Extractor now supports usage of deeply nested functions. Zendesk Extractor - fixed extracting of custom ticket values fields, existing configurations need to be resaved (switch to template->scroll to the bottom-> select a template again and save). New component for Mailgun (sending emails). 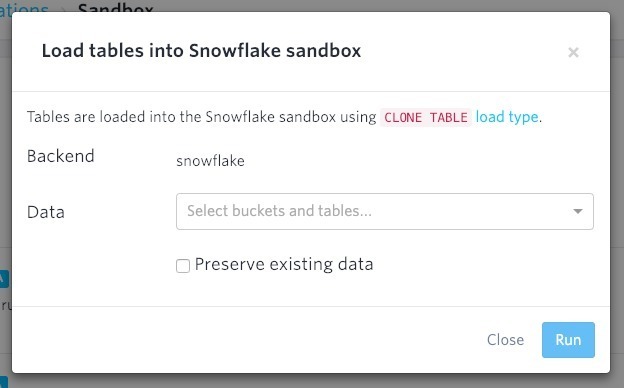 Generic Snowflake sandbox - now uses CLONE TABLE load type. It's way faster and it only loads complete tables (no rows sampling). 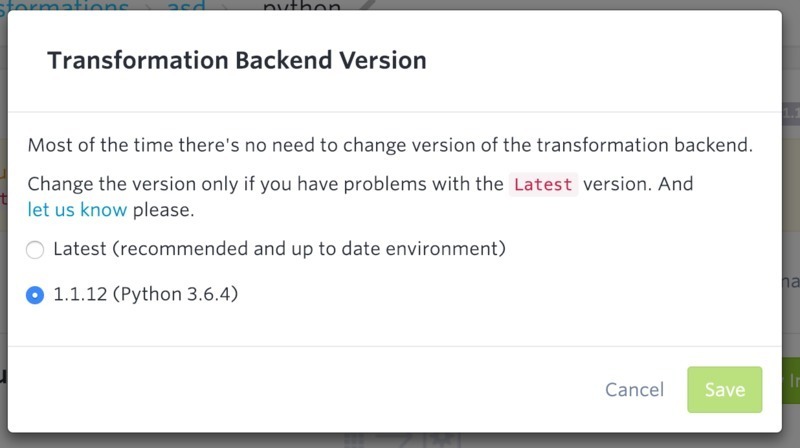 You can choose a backend version of R/Python transformations. Snowflake writer - adding a new table now autoloads column datatypes if present (usual for tables originated from db extractors). Transformations Output - shows warning when there are 2 output mappings with the same destination table within one phase. PostgreSQL Extractor - query editor now supports PostreSQL specific syntax. All newly created tables in Storage have 16MB cell size instead of 1MB. Limit 110 columns in data preview were removed, contents of wider tables are displayed normally. Organization invitations are now working similarly to project invitations - an invited user has to accept the invitation.